Many of you may have seen the movie War Room that was released in theaters this summer. It is now out on DVD and Blue-Ray. This movie was more than a theatric performance, it was a gift wrapped in truth. Since this movie, I have been more intentional on writing out prayers based on scriptures to address specific needs and concerns regarding myself and others. Before I share more, I want to clarify that my marriage is good and my husband is incredible. I love him dearly. At the time the movie came out, I was struggling with insecurity and perceiving my husband's words in ways he didn't intend. I was constantly anxious, afraid he would reject me. These fears were based solely on insecurity and lies from the enemy and not based in truth or reality in any way. A friend suggested I begin praying 1 Corinthians 13. In my struggling, I decided to write a prayer, like suggested in War Room, that I will share with you today in hopes that it might help someone else. Lord, may I be patient and kind, not envious, that I would not boast, nor be proud or rude. I pray I would not dishonor others, seek my own and would not easily get angry. I pray I would not only seek out my own interests, but also the interests the others. I pray I would not keep a record of wrongs, not delight in evil but rejoice in truth. I pray I would protect, always trust, always hope, and always persevere knowing your love never fails (1 Cor 13). Lord, I pray I would joyfully submit to my husband. I pray Chris would always love me as Christ loves the church and gave himself up for her. Lord, help me respect Chris at all times and communicate my respect for him effectively (Ephesians 5:25,33). I pray our marriage would be rooted and established in love (Ephesians 3:17). That our love may abound more and more in knowledge and depth of insight so we can discern what is best and may be pure and blameless for the day of Christ (Phil 1:9-10). Father, I pray we would love each other deeply and that love would cover a multitude of sins. I pray we would love one another with 1 Cor 13 love, your love. I pray we would remain in your love (John 15:9) and I pray Chris and I would not love the world or anything in the world (1John 2:15). Help us honor one another above ourselves (Romans 12:10). We pray for our love to increase and overflow for each other. May our home be full of your grace, love, peace, patience, kindness, goodness, faithfulness, gentleness, and self-control. In Jesus' Name, Amen. "Let me ask you something. If someone prays for patience, you think God gives them patience? Or does he give them the opportunity to be patient? If he prayed for courage, does God give him courage, or does he give him opportunities to be courageous? If someone prayed for the family to be closer, do you think God zaps them with warm fuzzy feelings, or does he give them opportunities to love each other?" The Lord answered my prayer above by giving me the gift of opportunity. My husband ended up partially tearing his Achilles tendon. Did the Lord cause that? I don't believe so. Did the Lord use it? Yes. Suddenly I was in a place were I had to put my husband's needs before my own. I had to look out for his interests above my own. I had to serve my husband in new ways such as driving him to appointments and doing the daily things he normally would have done independently. I was given the opportunity to convey my love for him in new ways. I was given opportunity to lay down my life for his. It wasn't the way I expected the Lord to answer my prayer. Did the Lord answer my prayer? Absolutely. Our marriage is better than ever. Our love is greater than before. People will warn you not to pray for patience. My dear friends, pray for patience and all the other good things of the Lord. He is faithful and gentle. The results may not come in a nicely decorated package, but the gift of opportunity will be worth any effort needed to unwrap the beauty inside (that is inside of you). Merry Christmas! May the Joy of Jesus fill you this Christmas season! Logging into my blog just now, I couldn't help but notice the date of October 23rd being the last post written. Sweet friends, that is too long to go without saying hello. My deepest apologies. This post has been stirring in my heart for a month or so. A Season of Misses. "Lord, don't let me miss this. Don't let me miss You this season." A weekend away at a women's conference. Spending sweet time with dear friends at the conference. A weekend away ministering at the Deeper Still Ministry retreat. A weekend women's conference in my home city. Going to my aunt's funeral, Speaking at a women's event. Going to visit my family in Illinois. Hearing a good friend speak at a women's conference. Going to the mom's group at my church. Going with my family to visit dear friends who moved away. This list is just some of the "misses" in the past two months. I am sure I cannot remember all of them. Why did I miss them? Life. A husband with a torn Achilles and sickness in our family the whole month of October. Then, my perspective changed. Perhaps my misses were not misses at all but rather the Lord redirecting my call. Sue, where is your heart? Do you hold up any of these as idols in place of Me? Let's take a pause and step back so you can realign yourself with my best for you. This season of misses turned out to be one of the best things that has happened for me. He has been teaching me to pause, to ask for His direction and turn my eyes towards Him. 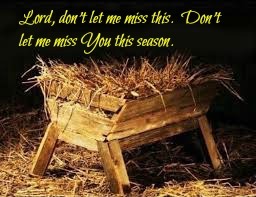 This Christmas season, I pray we will set aside time to reflect on and cherish the true Gift of this season. All the tinsel and parties and holiday events are fun, but too much business will cause this season to pass and we'll miss the One thing we need the most. Let's not miss the Person for the sake of celebration. Fully embracing Him and His glory is worth any misses. I'll gladly miss if it means gaining Christ.